Sir Isaac Newton is often considered as the greatest Astronomer and Mathematician to ever live. There is a lot of validity to this claim. This article looks at his famous reflector telescope and describes some of his discoveries. A reflector telescope is one that uses a mirror rather than lenses to bend light and magnify images. Reflector telescopes, because they are easier to make and can be made in sizes much larger than refractors, are an invention that changed astronomy and our understanding of the universe. The largest refractor telescope in the world is forty inches in diameter and reflector telescopes dwarf this in comparison. There are currently several reflector type scopes that are over four hundred inches in diameter. Illustration by Jean-Leon Huens, National Geographic Stock. If you are familiar with a prism or a rainbow you can understand why reflectors are superior to refractors. When light passes through the glass the different bands (or colors) pass through at different angles and this causes aberrations or problems in the images. This is called chromatic aberration and it gives us distorted views of what we see through a lens. In the time of Newton glass making and lens making was very primitive and the problems of chromatic aberration were not yet overcome. Today we can make lenses that have almost no chromatic aberration but we can’t make them very large. When a lens gets to be really large it gets very heavy and its own weight will distort the lens and ruin the image. Newton’s telescope solved these problems. A mirror doesn’t pass light through it. It simply bounces all the light off the surface. There is no chromatic aberration at all. And because you only need to bounce light off the surface you can place the whole mirror on a supporting structure or base which takes a lot of the weight off the mirror. This way you can build much larger mirrors without any distortion. It is commonly thought that Newton invented the first reflector telescope but it isn’t true. Credit for making the first reflector goes to an Italian Monk, Physicist, and Astronomer named Niccolo Zucchi. He published a book on Optics in the 1650’s and it is this book that inspired Sir Isaac Newton to build his own telescope. Zucchi created his first reflector around 1616 while Newton completed his first (and famous) telescope in 1670. But while Zucchi did make some new discoveries with his telescope it didn’t work well and was difficult to make and to use. It was Newton’s telescope that worked really well and that brought the art and science of reflectors into the world of science. All of that stuff is remarkable but there is something much more important in Newton’s Astronomy and in his telescope. He didn’t after all, discover moons around Jupiter like Galileo did, or plot the return of a comet like Halley did. 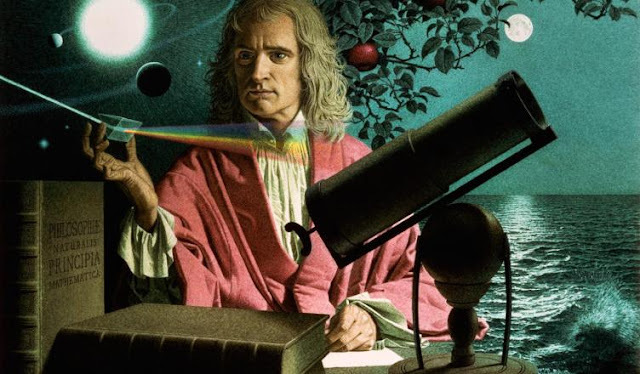 But what he did do was tie in Mathematics, Astronomy, and our understanding of the universe using his telescope and his theory of universal gravitation. He proved mathematically that gravitation was a two-way operation and that while the earth pulled on a falling apple so the apple too pulled on the earth. This was clearly seen, calculated Psychology Articles, and confirmed in the motions of heavenly bodies which was refined and made possible by the new science of reflector telescopes which we can credit to Newton. Sir Isaac and his telescope carried on with the work of Copernicus and Galileo by furthering our understanding of the universe we live in and helping us to realize there are laws that govern the whole of the universe. And this rule holds true for falling apples and for planets revolving around stars. Sir Isaac Newton's Original Reflector Telescope. Image by The Royal Society of London. 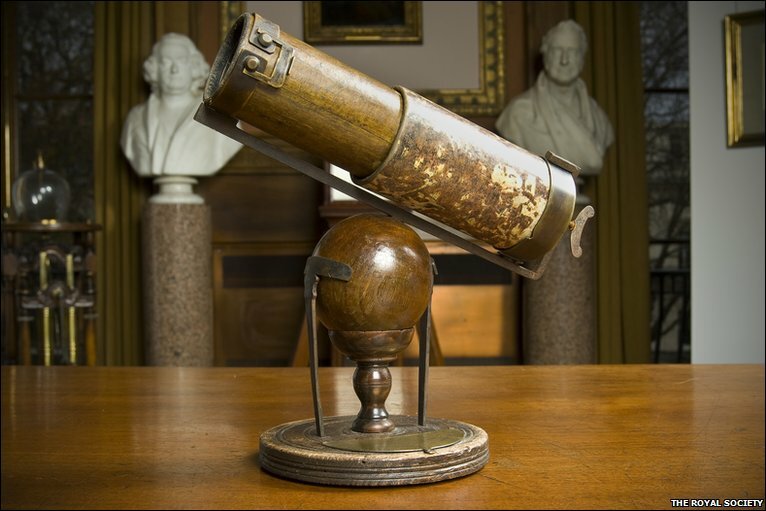 The actual telescope that Newton built still survives today and is in the care of the Royal Society of London. They keep it on display in London and sometimes it travels the world as part of an exhibit.